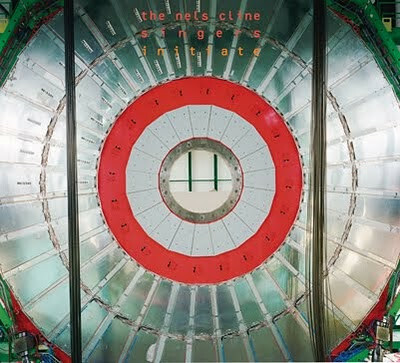 Tapes on the Floor: Album Review: The Nels Cline Singers "Initiate"
Album Review: The Nels Cline Singers "Initiate"
If you don't have a handle on how prolific guitarist Nels Cline is, take a quick look at his discography. The guy has played on a staggering number of releases, appearing along side a bevy of recognizable names in both the jazz and avant-garde scenes. Cline's latest record reunites him with bassist Devin Hoff and drummer Scott Amendola under the Nels Cline Singers moniker. Initiate is a two disc release, one featuring newly recorded studio material and the other documenting a live performance by the group at San Francisco's Cafe Du Nord. Both demonstrate Cline's more experimental and improvisational side, clearly showing why Nels is one of the more versatile players of his generation. The studio component of Initiate is a more subdued affair than past Singers records, however this more subtle approach has a way of making the group's talents very apparent. It's no secret that most of the record centers around the abilities of the band's titular guitarist, and nowhere is this more apparent than on "Floored", a straightforward tune which is propelled almost exclusively by Cline's improvisational might. On "Red Line to Greenland" a stream of delicate noise collides with a rush of epic riffs and fills that bring to mind the guitar-driven post rock tendencies of Mogwai. "King Queen" finds the trio joined by a distorted organ which weaves itself in-between the rhythms and melodies supplied by the group. In between these larger 'set-pieces' are smaller numbers, almost musical sketches set to tape. These highlight some of the unique sounds that Cline can achieve with a guitar, an example being his penchant for singing into his guitar pickups, beautifully demonstrated on opening track "Into It". It's all a little overwhelming at times, but the Singers have a way of catching your attention just when you start drifting away, making this easily one of their most engaging and enjoyable studio albums to date. In contrast, the live component of Initiate finds the band channeling some of their noisier tendencies while dipping into some of the best tracks from Cline's discography. Highlights include the percussive "Raze" which goes from all out rocker to Nels on solo guitar and then back again. A track called "Thurston County" gives a glimpse of what Sonic Youth might sound like if they were fronted by Nels Cline. The almost 15-minute closer entitled "Boogie Woogie Waltz" gives every member of the group their time in the spotlight with its tight rhythms and shifting melodies. As a whole, Initiate's second disc completes the portrait of this progressive trio as a group equally as raucous as they are understated.